Former welterweight champion and now boxing promoter for the Star of David Team, Dmitriy Salita, is excited about the line up for the Brooklyn Brawl event at Webster Hall on January 22nd, as reported by Doghouse Boxing. Junior Wright, a cruiserweight contender, will be fighting Texas tough man Rayford Johnson in 10 rounds. Salita told Doghouse boxing, “Junior was in camp with Adonis Stevenson for Adonis' fight on December 19th, and Junior is ready to challenge the best in the world. He's looking to make statement.” Salita says lightweight Dimash Niyazov's toughest test will be duking it out with champ Ariel Duran in 6 rounds. Gary Beriguette of Brooklyn has “never engaged in a dull fight”, said Salita, and will clash with the the popular Raphael Luna in 6 rounds. Ytalo Perea, a Pan Am champ from Ecuador, may win the heavyweight title in his bout with Emilio Salas. Alexey Zubov will be battling it out with Eric George in 4 rounds. Salita's team also includes Treysean Wiggins, who will fight against Llyas Askbaev. The exuberant Floriano Pagliara will punch it out in 8 rounds with Antwun Robersonin. Akil Auguste may continue his winning streak in his fight against Eddie Edmond. The star of the show might turn out to be one of Salita’s favorites, NY Golden Gloves champ Marcos Suarez, but his rival is undefeated Usiel Hernandez, and that is likely to be thrilling match. Star of David fighter Jarrell Miller has an 11-0 record and defended it by knocking out Aaron Kinch. 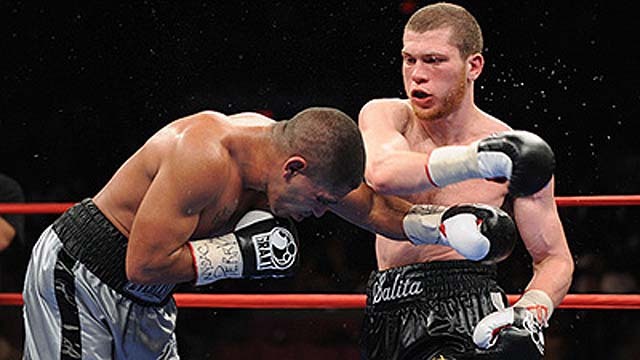 Dmitriy Salita, a native of Odessa and an Orthodox Jew was able to punch out all obstacles and captured the light welterweight championship, until he was defeated by Amir Khan in 2009. At first, his mother disapproved of boxing, but the fact that he refuses to box on Shabbat and holidays and keeps kosher must have given her nachas.